Diamond Custom Homes has broken ground on a custom spec home on Bonita Beach at 26385 Hickory Boulevard. 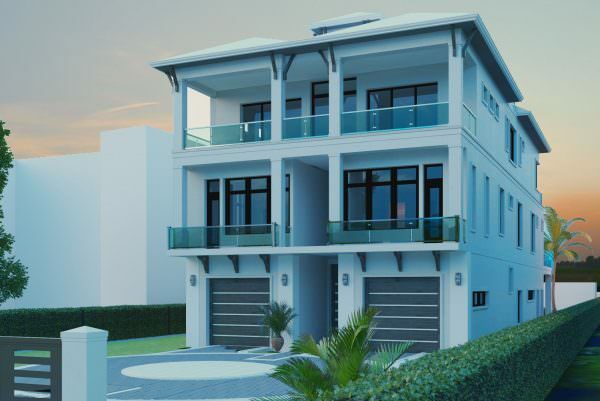 This three-story waterfront estate home will be an exciting new project for the Diamond Custom Homes team. Diamond’s twenty-five years plus of experience building in the south Florida market make them well equipped to master this picturesque estate. 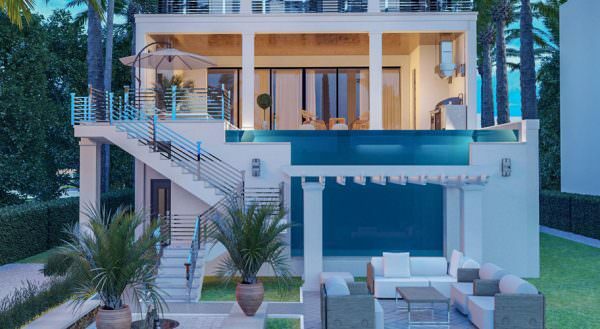 Key structural features of this home include second floor infinity edge pool and a third floor terrace. This 10,739 square foot home is designed by RG Designs. The home sits directly on the Hogue Channel, which feeds into Estero Bay, and has private boat slips. The perfectly symmetrical front elevation of this Hickory spec home features two garages on either side of the custom wood, double door entrance to the lower foyer. Within the lower foyer sits access to the elevator reaching from the ground floor to the top floor. The remaining space on the ground floor is occupied by nearly 2,000 square feet of storage space. Upon entrance to the first living level of the home by the staircase or elevator, guests are welcomed into the foyer, which features an open space with a railing overlooking the aforementioned lower foyer. Two guest suites are situated on either side of the opening, both with en suite bathrooms equipped with double sinks and walk-in closets, decks, and beach views overlooking the Gulf of Mexico across the street. The front wing of the first living level also features a powder room, laundry room, and pantry. On the waterfront side of the first level sits the open kitchen and grand room supplied with ample seating. The kitchen is well equipped with plenty of counter space, including a ten-foot kitchen island with double sinks and built-in dishwasher. Within this expansive kitchen area sits a dining room table. The living area will feature a linear fireplace with TV above. An extremely unique feature to this home will be the elevated, infinity edge pool area on the second floor overlooking the water channel. There will be an outdoor living area enclosed with a retractable screen, also with scenic views of the water channel when open. The concrete deck will include a pool bath, sink, grill, and a TV sitting above the fireplace. The second floor living area and top floor hosts the master suite, flex study or guest room, second laundry room, second powder room, sunset/relaxation room, and covered patios and decks. The master suite bedroom overlooks the Gulf of Mexico and has direct access to the third-floor sun deck. The master suite is complete with his and hers walk-in closets and an expansive master bathroom featuring an oversized free-standing tub. Building on Bonita Beach comes with certain complexities, like soft soil and small lot sizes forcing construction to move vertical. Diamond’s team of professionals is well versed in these more intricate components of waterfront construction, and will implement concrete pilings adding strong support systems to the home. “The unique structural components of this home make its construction an intriguing project for our team. This home is a unique departure from our past projects, but we are very excited about this opportunity and look forward to getting started,” says Michael Diamond, President of Diamond Custom Homes. This Hickory Boulevard spec home is projected to be completed and move-in ready by the end of 2019.